Earth Day Blog Hop- Recycle! check out all of the great books and activities being shared! 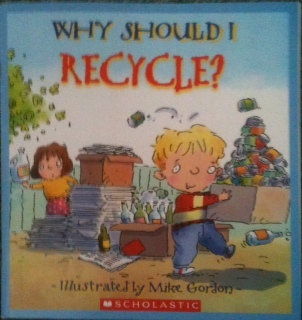 The book I am choosing to share is called, Why Should I Recycle? you can shorten the story for younger listeners :). We love to recycle our own paper. We have a wonderful multi-day non-electric process for recycling our paper. It is a great process to engage the children in. We have re-purposed laundry detergent bottles into butterflies for our rock garden! I made a bunch of butterflies and flowers out of aluminum cans too! 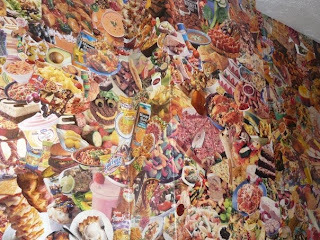 We recycled old magazine ads into wallpaper! like fairy bridges, puppets and necklaces! We recycle our dried out markers into all kinds of things! The insides can be used to make homemade liquid watercolors! We made old fashioned tin punch ornaments by recycling old juice can lids. We have recycled all kinds of containers to use on our sand and water wall. Our mud pie kitchen is filled with items we have re-purposed! And, our music area is made completely from re-used/re-purposed materials! We re-purpose A LOT! If you are interested in more, feel free to check the archives! There are a lot of Earth Day books along with fantastic ideas being shared by some other bloggers today! Stop by and bookmark or even go ahead and pin them all :). Do you have a great Earth Day book or activity to share? We'd love to hear about it! Leave a comment or link up below! Wow, what an awesome list of activities. I love the idea of recycling markers. We try to keep track or caps and replace them but you know how it goes. Thanks for the inspiration! I love all the ways you repurpose at your center! You outdoor cooking area is awesome! Wow! I'm loving all your garden ideas. I have a mudpie kitchen happening already but I'm so stealing the music idea. Awesome stuff! Thanks heaps for putting it out there. I need to remember your marker tip. JDaniel loses maker caps all the time.